Lake Wobegon is a fictional town in Minnesota, said to have been the boyhood home of Garrison Keillor, who reports the News from Lake Wobegon on the radio show A Prairie Home Companion. For instance, the residents of the town are convinced that the valedictorian of their high school must be the smartest student in the nation. But when the student goes to the state university, it becomes obvious that there are many “smartest students in the nation,” and in fact, the Lake Wobegon student is quite average. A subtle variation of the Lake Wobegon effect occurs when someone does excel in one particular area of life – but only one area of life – but thinks that his expertise in that one area makes him superior to others. For instance, you may be a good lawyer, perhaps one of the best in your town. But have you worked with attorneys in New York and London? Have you conversed with law professors from Ivy League schools? And, though you may, indeed, excel in law, is that your only area of expertise? Have you spent time with a gifted poet, a world-class scientist, or a Master of Wine? The solution to this limited and myopic view of life, as Stouffer suggests, is to “place yourself in the broadest possible context.” This will provide a more realistic setting in which to evaluate yourself, and it may motivate you to strive for higher goals. Karl Popper, 20th century British philosopher, said, “We all differ in what we know, but in infinite ignorance, we are all equal.” Be aware of your unfathomable ignorance and incompetence. Enjoy the fact that you may have burrowed deeply into a small space, but know that your tunnel is just one of millions. Realize your minute place in the universe and in history. What? – You may suffer from a myopic world-view which limits your perception of reality. So what? – Your narrow view of the world can limit you and impair your character. Now what? 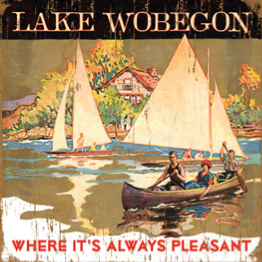 – Identify and describe your “Lake Wobegon” – the microcosm that you dwell in. Consider the town where you live, your social circles, your profession, your areas of expertise, and other areas. To avoid the Lake Wobegon effect, intentionally place yourself into a larger context: spend time with people who are better at other things than you; attempt to do something that you will likely fail at. Leaders – Is the Lake Wobegon effect limiting your organization? How does your organization compare with other, similar organizations? How could you, on a regular basis, place your organization in a larger context that would provide a more realistic appraisal?